The original Purschenstein castle was once one of the oldest castles in Saxony. Lying on the old Salt Road that connected to Prague, the first documentation comes from a “Castrum Borsensteyn” first mentioned in 1289, although the castle was much older. Its function was to provide protection and exact tolls on the salt traders. The name is thought to come from the Knights Borso. From the 14th century until 1945, the castle remained in the hands of the von Schönberg family, one of the most noble of Saxony. Badly damaged in the Thirty Years War, the castle was rebuilt in a variety of architectural styles. 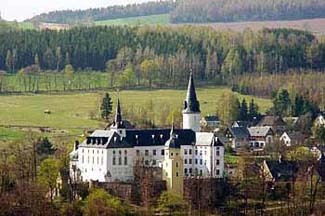 During the time of the GDR, the castle served as a children’s home and cultural center. A Dutch family bought the property in 2005 and rebuilt it into today’s castle hotel. In 2005 Henriette and Roelof Praagman first laid eyes on a rather sorry looking Schloss Purschenstein and knew they had to restore it to its former glory. It took two years of hauling away rotting wood, old cables and batteries from the GDR days, and an antiquated heating system before renovation could begin. Thanks to their labor of love, this beautiful castle is open for guests to enjoy. Fantastic! Off the usual tourist track, the castle is close enough to Dresden and Prague to make daytrips feasible. Neuhausen in southeast of Chemnitz and just 7 km from the border of the Czech Republic. Look for route 171. In the village of Sayda, look for a sign that says Neuhuasen. Arrangements for a 20-pax mini-bus can be made for Dresden or Prague. Off the beaten track in southern Saxony and just 7 km from the border of the Czech Republic, Schloss Purschenstein has welcomed travelers and traders since its days as a stop along the Salt Road. Winding along the back roads through conifer forests and rolling hills, you’ll spot the turrets and roof line of the castle before you enter the village of Neuhausen. This friendly castle hotel offers clean rooms spread out in three different buildings. In the main castle, an elevator takes guests to their rooms. Guest rooms vary in size, and you have a choice of a standard double, suite, or a duplex with the bedroom reached by stairs from the living area below. All are nicely furnished with the occasional antique piece, parquet floors, and modern bathrooms with either a shower or bathtub. For those who need to stay connected, you’ll find free Wi-Fi. Most meals may be taken in the “Remise” or former coach house, which also holds some guest rooms. The hotel’s cuisine is highly regarded and reasonably priced. Hearty breakfasts are served buffet style. An outdoor terrace is the place to enjoy a specialty coffee.